"Dr Marvin....is this a bad time?" The relationship of a patient and therapist is based on trust. Psychotherapists are instructed to keep their relationships with patients strictly professional, and to avoid dealings with them outside the office. But what happens when the patient won't take no for an answer? Bill Murray stars as Bob Wiley, a multi-phobic neurotic mess who, among other things, fears he might not find a bathroom conveniently and his bladder might explode. His new therapist, Dr. Leo Marvin (Richard Dreyfuss) is set to go on vacation and to work on publicity for his new book. Unfortunately, Bob is one of those folks who won't take no for an answer. Bob follows the doctor to his vacation home in New Hampshire and proceeds to both win his way into the hearts of the doctor's family and drive Leo completely nuts. Bob Wiley is the role that Murray was born for. He beautifully captures Bob's neuroses and various twitches, alternating them with a winning charm and a good heart. Dreyfuss makes a superb foil, starting off completely in control and progressively losing it worse and worse as Bob works his way into the family. The supporting cast of the family, Julie Hagerty as Leo's wife Fay, Charlie Korsmo as son Sigmund and Kathryn Erbe as daughter Anna also help make the central comedy work by grounding the tension between the two leads in reality and humanity. In the background are the Guttmans, New Hampshire locals who resent Leo's acquisition of their dream house and who help Bob out, thereby making Leo go out of his tree. The dinner scene in particular is a masterwork of comedic playing. Director Frank (Yoda) Oz does a splendid job of getting the finest performances out of his cast. The whimsical and bumptious score by Miles Goodman helps the comedy as well, with a Danny Elfmanesque good nature and brass. All in all a nearly perfect comedy. The only potential drawback is the occurrence of several outbursts of foul language which Bob (and later Sigmund) go into, feigning Tourette's syndrome. While I found them hilarious, some might find them pretty offensive. Image Transfer Review: Touchstone gives us a decent non-anamorphic picture. Colors are vivid and blacks are rich and solid. Just check out the eye-popping turquoise of Murray's "Don't Hassle Me, I'm Local" t-shirt. Little is seen in the way of artifacting or edge enhancement. Reds are satisfactory and I saw no signs of chroma noise. Quite acceptable for a comedy film without major effects. Audio Transfer Review: The Dolby Surround tracks, in both French and English, give the dialogue cleanly and without distortion. The music comes across well in both versions. The dialogue is pretty much center-oriented, and the surrounds are primarily used for music and rain sound effects. Extras Review: The disc is lacking in extras. There is a full-screen theatrical trailer with rather faded color; it makes one appreciate how good the picture of the feature presentation is. Both subtitles and closed-captioning are provided, though both are English only. The subtitles are in yellow for maximum readability. Chaptering is adequate. Best of all, there are no forced trailers at the beginning, and the FBI warnings can be skipped by use of the chapter forward key on the remote. 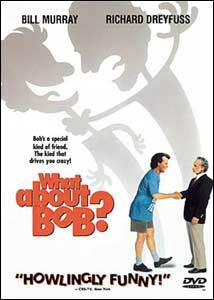 What About Bob? is one of the best comedies of the 90's. It makes its debut on DVD with a nice, although non-anamorphic transfer. Very highly recommended, although the extras are lacking.